What Philadelphia recognizes as Mummers in the modern era began taking shape throughout the 19th century, as the many traditions of Philadelphia’s neighborhoods contributed to larger, public celebrations of the city’s working-class communities. 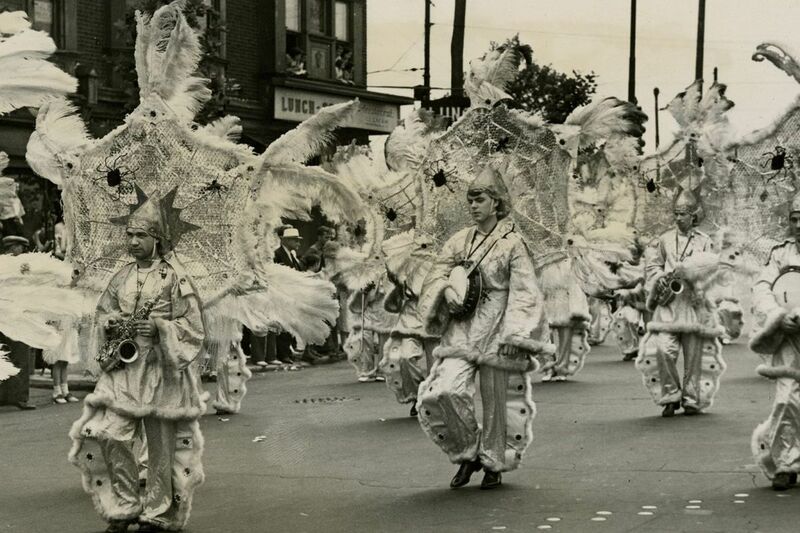 Pictured here: Mummers Woodland String Band in 1937. Swedish immigrants to the Southeast Pennsylvania region brought their traditions from Northern Europe with them when they settled along the Schuylkill in 1643, including the celebration of "Second Christmas" on Dec. 26. Having spent time with family the previous day, people would roam their neighborhoods, entertaining friends and sharing drinks and food. Some integrated costumes into the holiday and began celebrating through New Year's. As other groups arrived in the area, more and more traditions blended together. Finnish, Irish, German, English, and African cultures shaped the way that Philadelphia and the surrounding region celebrated at the end of December, which became more raucous as the years passed. Many Philadelphians owned guns, which they sometimes turned into noise-makers during New Year's festivities in colonial times. The Mummers Parade grew out of this variegated background, resulting in Philly's famous (and famously peculiar) New Year's tradition. The name — taken from the mummers plays that have been a tradition in England since the 13th century — etymologically traces back to the Momus of ancient Greece, a character personifying mockery and satire who appeared in Aesop's Fables. Today's celebration does justice to its namesake. What Philadelphia recognizes as Mummers in the modern era began taking shape in the 19th century, as the many traditions of Philadelphia's neighborhoods contributed to larger, public celebrations of the city's working-class communities. The city actually attempted to ban masquerade halls — centers of influence that would eventually inform the style, dress, and practices of Mummers — in 1808, though the interdiction ultimately failed. There are 1840s reports of men donning clown attire for New Year's celebrations. Roaming groups of partiers would barge into taverns, requesting free booze and acting rowdy, generally spurning the civil norms dictated by the city's still-nascent police force (officially founded in 1854) and governing elite. The city's time-honored tradition of shooting guns off continued unabated. Procession from the Mummers Parade, 1943. While the authorities sometimes cracked down on unruly December celebrations in the final decades of the 19th century, a reporter and vaudeville promoter named H. Bart McHugh saw an opportunity for the city to celebrate New Year's in a spectacular fashion. McHugh appealed to Mayor Samuel Ashbridge to include Mummers in the city's New Year's parade, suggesting that the move would simultaneously provide a reliable spectacle for onlookers (Mummers clubs had already popped up and attracted fans) while enabling the city to exert control over the historically chaotic celebrations. Thus, 1901 marked the first, officially sanctioned Mummers Parade. There have been changes over the years. Firing guns on New Year's is now — of course — strictly forbidden, as the practice poses mortal danger. Authorities underscore this each year during a news conference with a victim of New Year's gunfire, vowing to arrest offenders. Though the Mummers Parade has provided an outlet for joy and revelry (not to mention an excuse for heavy drinking) for Philadelphians throughout the years, it has also been a flash point for bigotry. The costumes and makeup of Mummers from the first half of the 20th century made use of blackface, a practice that was only banned by court order in 1964 to protests by participants that their traditions were under attack. More recently, there have been displays suggestive of blackface, as well as discriminatory depictions of Native Americans, Latin Americans, and transgender people. There is an initiative to eliminate such expressions of intolerance, and participants and onlookers alike can learn from the historical record. Note: James A. Bland, a black composer, wrote the parade's unofficial anthem, "Oh, Dem Golden Slippers."